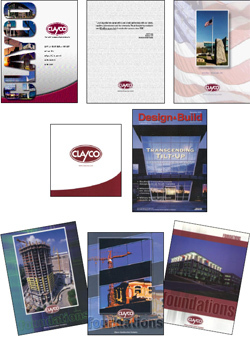 Differentiate and leverage Clayco success in logistics, corporate structures, sports/institutional facilities, food and beverage and industrial/manufacturing design and construction. Public relations efforts generated more that $3 million worth of media exposure for Clayco (including multiple cover stories and feature articles). Foundations Newsletter won national award for excellence. Improved flexibility and quick response to RFQ and RFP opportunities through high quality/modular color output and binding systems.